Enhanced consciousness among women about physical appearance is driving the demand for cosmetic surgery and breast augmentation is the most popular cosmetic surgery among various cosmetic procedures. Breast implants are the medical devices that are implanted under the breast to increase the size and provide perfect shape to the breast. Patients being well-informed about the breast implants are opting for small breast implants than the large breast implants. Small breast implants are considered to be more comfortable for athletic and fit look. Meanwhile, in recent years, fat transfer breast augmentation has also gained popularity. This procedure involves transferring fat through liposuction from one part of the body injecting it into the breasts. Fat transfer procedure is also highly preferred as it helps in removing fat from the area with excess fat and offering a natural look with enhancement of the breasts. Moreover, technological advancements have also resulted in the next-generation of breast implants that are light in weight as compared to the traditional breast implants. 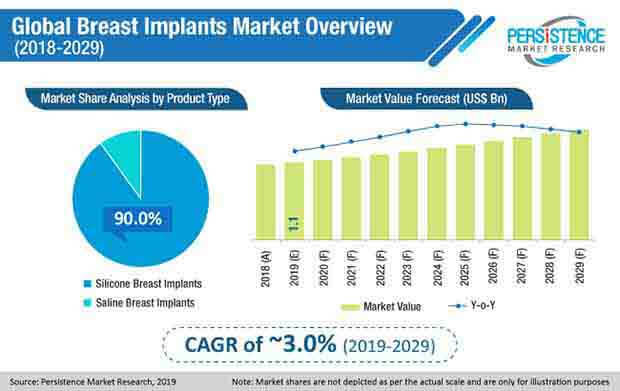 According to the report by Persistence Market Research (PMR), the global market for breast implants is expected to see a moderate growth during 2017-2024. The global breast implants market is also estimated to reach US$ 1,482.1 Million revenue by the end of 2024. Compared to the Saline breast implants, silicone breast implants are gaining popularity in the global market for breast implants. Both surgeons and patients are preferring silicone breast implants as they look more like natural breast tissue, owing to their consistency. Moreover, silicone breast implants are less likely to leak that can result in the complications that need additional surgery. Silicone gel implants look so natural that it is difficult to differentiate it with natural breast tissue. Hence, the demand for silicone breast implants is witnessing a significant growth. Moreover, manufacturers are focusing on producing lightweight silicone breast implants eliminating the chances of sagging. Gummy bear implants also known as cohesive silicone gel implants continue to gain popularity globally. Gummy bear implants are different from silicone and saline implants as they are more natural and soft, and also have a very low rupture and leak rate. Increasing number of women are also choosing the placement of breast implants. Here, under the muscle augmentation is popular as it is less invasive, reduces bleeding, swelling and pain. Fat transfer breast augmentation involves liposuction that removes fat from one part of the body and transfers it to the breast. This involves moving fatty tissues to the breast to enlarge them. Fat transfer procedure is gaining popularity as it results in less scarring compared to the breast implants and feels more natural as the breast are enhanced using person’s own tissue. Latest trends with a focus on natural remedies, lifestyle and cosmetics are contributing to the growth of fat transfer breast augmentation. Fat transfer procedure is also outpacing saline and silicone breast implants in some of the countries. However, the biggest restraint is that fat transfer breast augmentation is not permanent, because the human body metabolizes at least half of the reused fat within few months of surgery.